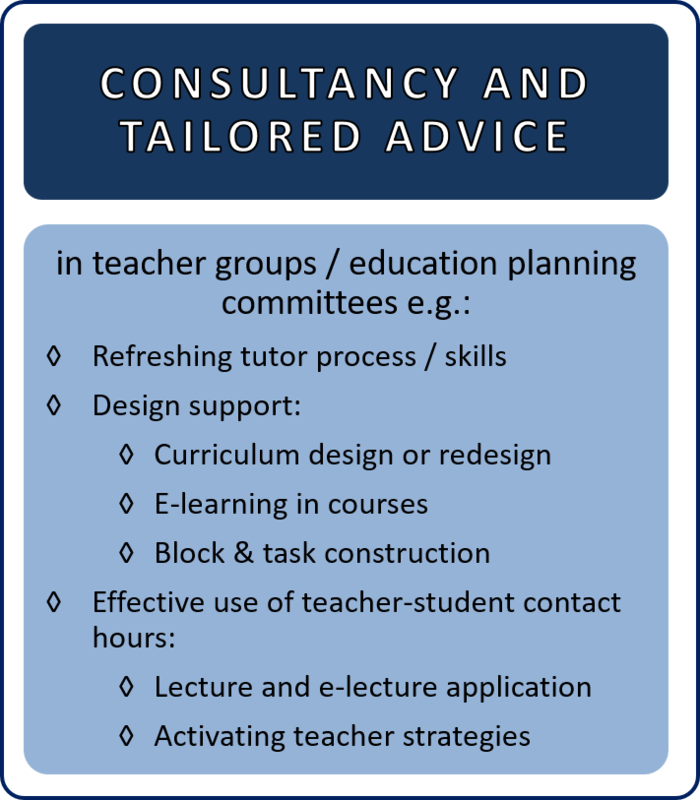 In consultation with the Taskforce Faculty Development, individual advice or coaching can be offered to meet the specific wishes of individual FHML teachers or teams of teachers (such as departments, block planning groups, educational program committees, exam committees). Longitudinal guidance can be provided, for example in curriculum innovation projects. After attending the Introduction to Principles of PBL course new staff members with educational tasks attend the course Tutor/teaching skills (Small Group Teacher Training), the course Mentoring skills (focus on guiding and coaching of individuals) or the CORE training. After having gained additional educational experience, staff members can start the University Teaching Qualification (UTQ). To meet the participatory requirements of all courses attendance and active involvement are required. From autumn 2019 we will offer support in Continuous Professional Development. To meet the participatory requirements of all courses attendance and active involvement are required. If you want individual tailored advice, or tailored advice for a small group, please click on ‘inquire’ and we will contact you within three weeks. "Why are we using PBL?" In this one morning session, the principles of Problem Based Learning (PBL) are introduced shortly. Acquire insights and skills for teaching in small groups. This course is a precondition for all educational roles for small group teaching on A-level. You have to follow the training which is scheduled 2-3 weeks before the start of the course in which you are assigned in a teaching role. Introduction to mentoring skills within a problem based learning environment, with a focus on individual coaching over a longer period. The course mentoring is a precondition for bachelor mentor roles (A-level). The course mentoring is a precondition for master mentor roles (A-level). If you are interested in this training click on ‘inquiry’. If five or more staff members have showed interest for the training we will contact you and set a date. Introduction to CORE education, feedback on simulation patient contact (SPC) and instruction for group dynamics in the CORE group. This course focuses on educational design, delivery, assessment, evaluation, reflection and collaboration. Prerequisite: PBL Principles and Tutor/Mentor/Core course. The UTQ certificate is a precondition for all educational roles on B- and C-level. For these workshops, no specific dates are scheduled. If you are interested in a workshop click on the name of the workshop you want to attend. Then click on ‘inquiry’. If five or more staff members have showed interest for the workshop we will contact you and set a date. If after four weeks less than five staff members applied we will contact you for tailored advice and coaching on this topic.